Netanyahu motorcade headed straight to Tel HaShomer Hospital after 12 hour flight from Canada. 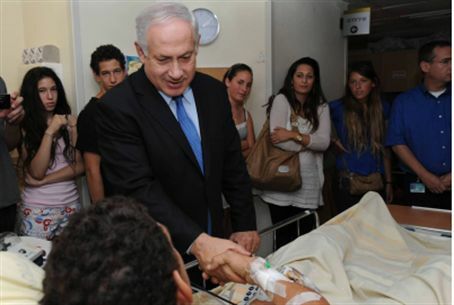 Prime Minister Binyamin Netanyahu visited the wounded soldiers from the 'Shayetet 13' Naval Commando Unit Tuesday. The soldiers were admitted to Rambam Hospital in Haifa Monday after suffering injuries from a violent mob while gaining control of the Turkish-sponsored terror-sympathizers' flotilla. Netanyahu cut short a North American tour and canceled a meeting with United States President Barack Obama in order to return to Israel after the bloody maritime incident. Once his plane landed in Israel after the 12 hour return flight, Netanyahu's motorcade headed directly for Tel HaShomer Hospital where the wounded soldiers are being treated. First Sergeant O. told Netanyahu he was hit by a bullet in the abdomen. “The bullet went right through my stomach,” he said, pointing out the entry and exit wounds. Another soldier in the elite unit, First Sergeant Y., told the Prime Minister that he was assaulted as soon as he reached the boat's deck and was thrown off the deck. As a result he is suffering from a seriously fractured skull. “I hope I can recover in time for the next IDF [physical fitness] championship,” he joked nonetheless. Doctors said that Y. 's speedy recovery is a near miracle and that they believe he will be going home soon.